The ghosts of my past having been pulling at my heart strings lately. The pull is so strong is tangible. The pull started long before my visit to my grandmother yesterday, but she only made it worse. For most of my life my grandmother was the dowager empress of the family. She sat in our old, family house like a queen. 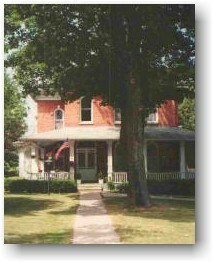 Our family house is in Cheboygan, Michigan and it is 150 yrs old. It has been in our family for all those long years when my great, great, great uncle built it as a wedding present for my great, great, great Aunt Newton. The house was haunted. It wasn't something people spoke of often, but it was certainly a given. Entire batches of photographs were thrown out because white mists permeated all of them obscuring the faces of the living. Strange noises came and went at night. There was a cold spot in the middle of the old kitchen at midnight. There are so many stories it is impossible to list them all. I visited once after a wedding. I never took out my wedding clothes at the house. I left them at the bottom of the suitcase. After my departure, they were found laid out on the floor of the attic. There were no children or pranksters present during that trip. Strange things like that were just normal there and that house was and is my favorite place in the world. When I was a girl I used to hide under the piano in red parlor so I wouldn't have to go home. The house was my home. It was huge and beautiful and it was part of our family legacy. With eight bedrooms and 2 kitchens and 2 parlors, a library, a den, and a dining room it was large enough for my entire family to meet in every summer. All my aunts and uncles and cousins would fill the halls with laughter and drinking. The adults would play cards well into night and the children would creep around the darkened rooms when we were supposed to be asleep. Many years have past since those days. The family has broken apart. Everyone got divorced and the cousins were left drifting in the wind. Even my grandmother, the dowager empress herself, has dementia and must now sit alone in a nursing home while her castle sits empty. Yesterday, she and I looked at photos of the old days and I wanted to weep. Ghosts drifted in and out of the pictures like family and she smiled and spoke of the house like a person. To her, the house is alive. It is her great love and best friend. The house is for sale now and I have no ability to stop it. It sits empty while the price drops as no one wants an old mansion in Northern Michigan. My grandmother says some day she'll go back there and maybe she will, but not in life. Maybe some day her ghost will join the others and she'll be empress once again. I wish I could be there when she returns. I wish we could keep our haunted castle. What an awful feeling to see something you love so much sit empty and sad. If I had money I would buy it for you. I can tell how much you love this house. I have the same love for my grandmothers home. Thankfully after she passed my Aunt and her family moved in. They are caring for it now and doing a lovely job! Hope you day is filled with lovely memories love! I can so relate to that. We had to sell the family home because of my father's ill health and I so wanted it to be passed down through the generations. It was so loved that anyone who lived in the carriage houses would come back many decades later just to see the place and say they never got it out of their minds. My family vowed to haunt it. Most of them are dead now. I suppose they are squatters on someone else's property now, but hey if you can't live there in the afterlife, what use is the afterlife? I'm with you. I know I'll be there with my family in the afterlife. Hopefully they'll all be happier then. I would love to save it and have pitched many ideas for renting it out as a vacation property. I thought it would be a nice haunted rental, but the family up there really don't want me involved and I'm one generation down from those who own it. My mother still wants it, but needs money for mounting assisted living costs associated with my grandmother and her 2 cousins who also own it defer to one of their husbands who is very hostile and doesn't want to try anything new. I can't get past him and I'm not there to really fight. So I just have to let go. It is a shame. They are selling it for a 10th of what it is worth because property values have crashed in Michigan. It seems like a sin, but such is life. Yes, I know what you mean. I always wish we had a big family place for us all to get together whenever we wanted. My folks' little house serves as that for our nuclear family. But they are getting older. There are so many stories, spooky ones too, with "the family place" as a central character. On our reservation we even had an entire "hollow" that was family. It passed out of family hands. At least the tribe owns it so I can visit it any time I get back that way. I write the Paranormal Montana blog. I'm so hoping there will be a way for this to stay in the family. I'm certain it must be far more heart-wrenching for you, than it is for me; just reading this beautiful, but sad story. And if for some reason you're unable to save your beloved family home? Perhaps the next to own it will love it, honor it, and cherish it just as much as you and your family. Perhaps they will love your family that resides or visits just as much as you, your mother and your Gran. Oh, what a beautifully written post. After watching my beloved Gram, then my mom, deal with dementia, my heart went out to you. And then to have such a beautiful and storied home in your family just sitting there...I hope there's a way to keep it in your family. Thanks for sharing this part of yourself.